Little Rays of Sunshine! : Jayda's Halloween Extravaganza!!! Halloween is approaching fast and though our families mind has been focused on that day for reasons other than dressing up in costumes and eating candy til our stomachs hurt,(because my brother in law is leaving for his mission that morning), the delimma for finding Jayda's 1st Halloween costume resumed.....til now!!! 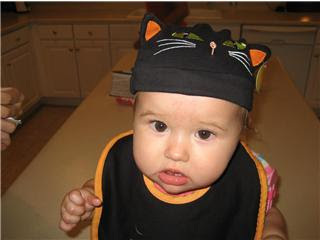 :) She was going to be a little black cat. My mom had gotten her a beenie that had ears and eyes on it and a little bib to match, since my almost 1year old still spews everywhere when she eats. So this week I was cleaning her room and decided to try her costume on her to see what she'd think of it. LUCKILY I did b/c the durn thing didn't even fit anymore. I guess her head just keeps on growing while the rest of her short, petite little body doesn't. I should've known too, b/c we just went to the doctor last week and she's still in the 10% for her height, 20% for weight and like 50 or so % for her head hahaha!!! Anyways we decided she could be a little fairy or something. 1. b/c my cousin Julie told me how easy it'd be to make a tutu...her having just done it herself for her little girl, and 2. b/c my cousin megan hooked me when she explained there's a $1 section for fabric, so off to walmart we went and this is then end result! It wasn't hard to make at all and I could've made it thicker and longer but i cut it short so it would kind of stick out. I'll post some more pictures of her and her little cousins when Halloween rolls around. Not bad for the first time though! Love that her head is bigger too. Kate's head is off the charts. We had to do an MRI because it is so big. Love it! No way is she only in the 10 and 20%! Trey is too! ya, don't worry she will grow in to her head. Trey's head was in like the 90% until like 6 months ago haha. It just means they have tons of brains so they will be really smart! you are going to have to teach me to make one. it is ADORABLE. I am so glad the $1 section of fabric was as satisfying for you as it has been for us! Thats awesome! 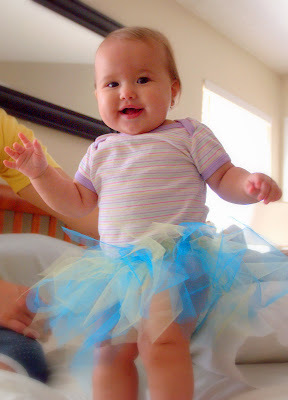 I am glad it worked out for you because I think the tutus are soo cute! Jaymi is doing that same thing but she is making a little wand to go with because I told her that Kaitlyn just loves her wand .. if you want to add that to it too! Hahah.. Anyhow, looks awesome! Oh.. and you got a tiny one, and I got a huge one.. Kaitlyn has always been in the 80th to 95th percentile for EVERYTHING!! Little chunk! I love the tutu. It turned out super cute! I really like your choice of colors.